In a perfectly pitched black comedy, Claudia Piñeiro confirms the promise of Thursday Night Widows, her first novel to be translated into English. All Yours is a short book, but one that packs a real punch despite its deceptively light-hearted tone throughout. Most of the novel is a direct window into the stream of consciousness of Ines, who has been married to Ernesto for more than 20 years. At first we see them as having the perfect marriage that Ines would like to believe is real, but we find ourselves constantly reassessing reality as Ines is forced to suspect Ernesto of being unfaithful to her, and as we come to learn via witnessing her “in passing” thoughts, how they came to meet and marry. Unlike the blurbs on the cover and at the publisher’s (and retailer) websites, I’m not going to provide plot details here, because knowing them in advance would simply deflate this souffle of a novel, which is light, short, funny and as nasty as it gets. (This is one of those books where even a bare plot summary is the same as providing spoilers.) On the one hand, one can’t stop smiling at Ines’s thought-processes and actions as she makes new discoveries about her marriage and what she assumes her husband is capable of – especially when she goes through all the possible interpretations (filtered through rose-tinted glasses while thinking about the dry-cleaning and other domestic trivia) of each piece of evidence she finds in the house or encounters on her trips out – yet on the other, one is horrified and saddened by the trap that she and Ernesto are in. Just who is deceiving who, and how far will either one of them go? These are questions that the author puts in several different guises, and answers in no uncertain fashion. The most tragic part of the novel is the interwoven story of Laura, Ines’s and Ernesto’s teenage daughter. Obsessed with her husband, Ines has no time for the girl while Ernesto, though adoring her, is unable to relate to her in any useful way. The two parents are totally locked into their own concerns, and fail to see what’s happening to their daughter, let alone help her. Laura’s story is told in tiny little phrases, underlining her irrelevance to her mother and her lack of presence in her family home. We gradually come to realise how the story of Laura exactly mirrors that of Ines and Ernesto when they were her age – but will she act, or turn out, the same? The author does not waver from the engaging, chatty tone of this book, which makes the reader a confidant of Ines and hence automatically on her side before realising how far we have been drawn down the path of collusion. Ernesto, a shadowy figure seen only through the eyes of the four female characters in the novel, is someone who is very easy to dislike. Ines is a vivid, opinionated and sharply drawn character. She carries the novel, and whether she will manage to juggle all her complex balls in the air or whether they will all come crashing to the ground in an apocalypse, one cannot help but have a degree of sympathy for her, not least because of what we know about her mother and her background. I thoroughly enjoyed this novel, with its constant challenges to the reader’s loyalties and its regular shifts of perspective while maintaining an airy tone whatever the nightmares being described. I highly recommend that you read it (but put on a blindfold when it comes to reading any blurbs or synopses, as it really would spoil the book’s impact to know too much, or even anything, before you start). 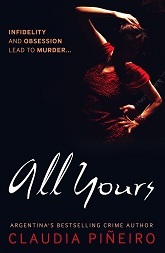 Other reviews of All Yours (all of which provide more details about the plot than I’ve done here, so you’ve been warned! ): It’s a Crime!, The Bookbag, Crime Time, International Crime Fiction (where Glenn has a different view from mine about the Laura aspects of the plot), and Crime Scraps (where Norman explains why he did not like the book as much as some other reviewers. I felt the translation was smooth and colloquial, but I agree that the use of the term “Mum” in the earlier Laura sections jars and is a bit confusing). I purchased my copy of this novel. Sounds like a book worth reading. I liked Thursday Night Widows, which was both informative about Argentina’s economic crisis and packed a punch, too. The characters in that book grew on me, and I was interested in what happened to them. I think so, it’s a very good second novel, and addresses the same theme – relationships in a materialistic, free-choice world – in a different way, and style, from TNW. Maxine – What an excellent, spoiler-free review! This one’s been on my radar screen for quite a while, actually. I’m fascinated by the idea of these two people going through their daily lives and having that be the backdrop for a web of deception – deliciously eerie. I really must read this. Great review. I agree, it’s a very interesting book indeed.